Yedda Morrison’s installation Kyoto Protocol, Articles 1, 2 & 3 will be at Right Window through Monday April 30th. The Kyoto Protocol’s primary objective is to monitor and control greenhouse gas in an effort to prevent climate change. The Protocol was initially adopted in December 1997 in Kyoto, Japan. As of September 2011, 191 states have signed and ratified the protocol. The only remaining signatory that has not ratified the treaty is the United States. 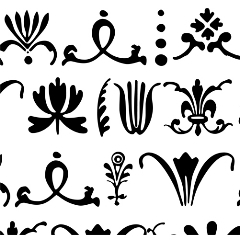 Kyoto Protocol (wallpaper & fabric) consists of Articles 1-28 rendered in Bodoni Ornaments font. Kyoto Protocol (Wallpaper) is printed on commercial grade wallpaper (width 36", length as needed). Kyoto Protocol (Fabric) is printed on upholstery fabric and available by the yard (width 58", length as needed). Both are currently available in three color ways: Nitrous Oxide, Carbon, and Methane.